NEW DELHI:Raising slogans "Bharat Mata Ki Jai", "Fir Se Ek Baar Modi Sarkar" and "Mai Bhi Chowkidaar Hoon", four BJP candidates of Delhi filed their nomination papers in their respective returning officers' office and pledged to make Narender Modi again the Prime Minister. Raising slogans "Bharat Mata Ki Jai", "Fir Se Ek Baar Modi Sarkar" and "Mai Bhi Chowkidaar Hoon", four BJP candidates of Delhi filed their nomination papers in their respective returning officers' office and pledged to make Narender Modi again the Prime Minister. Sitting MP Ramesh Bidhuri in presence of Transport Minister Nitin Gadkari filed his nomination papers from South Delhi, another sitting MP Meenakshi Lekhi from New Delhi, sportsperson turned politician Gautam Gambhir from East Delhi and singer Hansraj Hans from North West Delhi reserved parliamentary constituency filed their nomination papers today. After filing the nomination, Bidhuri asked party workers, "I hope for your love and affection in the coming days." In the midst of slogans "Delhi Ke Booth Se Ho Raha Muhurat Hai-Paanch Saal Aur Mere Modi Ki Jarurat Hai" and "Aayega to Modi Hi", Gautam Gambhir filed his nomination papers in East Delhi. Before filing nominations, Hansraj Hans visited Balmiki Mandir to get the blessings of Bhagwan Balmiki. He said, "I will come true to the trust reposed in me by the BJP. The BJP has always received the blessings of the Dalit community," he said. Meenakshi Lekhi filed her nomination papers after performing a 'hawan' and a roadshow. Thousands of workers assembled on this occasion and the entire atmosphere was full of expectations of forming the Modi government again. There was great zeal among the women and children. Before reaching the Deputy Commissioner office for nomination, Lekhi said, "We are ready to win all the seven seats and make Narender Modi again the PM". After a long wait and speculations, all seven candidates of the Congress, including three time Chief Minister and DPCC president Sheila Dikshit, filed nominations on last day today. Dikshit accompanied by her sister, a legal expert and a large number of party workers filed her nomination papers at the Deputy Commissioner office at Nand Nagri for the North-East Delhi Lok Sabha seat. 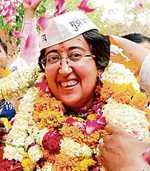 After filing her nomination papers, Dikshit said she was familiar with the constituency as she had contested her first election in Delhi from this constituency, and had an emotional attachment with it. "I know the people here and they know me. We started the Metro project from here," she said. She said she was energised by the enthusiasm shown by the Congress workers for her Lok Sabha candidature from North-East Delhi, and she was confident of pulling off a comfortable victory with the unstinted support of the Congress cadres. The other Congress candidates from Delhi also filed their nomination papers today at the office of the returning officer in their respective areas. Ajay Maken filed nominations papers from the New Delhi Lok Sabha seat, Jai Prakash Agarwal from Chandni Chowk, DPCC working president Rajesh Lilothia from North West Delhi, Arvinder Singh Lovely from East Delhi, Mahabal Mishra from West Delhi and Vijender Singh, gold medalist boxer, filed papers from South Delhi. Among them Rajesh Lilothia and Arvinder Singh Lovely are contesting parliament elections first time. They earlier had contested assembly elections and were close to Sheila Dikshit. Lovely was Education Ministry the Dikshit government in Delhi. Vijender Singh is a novice in the fray. His name was nowhere in the picture. The Congress had almost decided to field former MP Ramesh Kumar from the area and younger brother of 1984 anti-Sikh riot accused Sajjan Kumar. But his name was dropped after Sikhs under the leadership of their eminent leader Manjit Singh GK had protested near the AICC office. NEW DELHI:The AAP has planned a central manifesto to be released on April 25 for the May 12 Lok Sabha elections while next month after May 1, its seven candidates will release their constituency-specific manifestoes. NEW DELHI:Sitting BJP MP from Northwest Delhi today tweeted to the party's national president, Amit Shah, for not being given ticket so far though today is second last day of nominations. NEW DELHI:A 23-year-old man was shot dead allegedly over a land dispute in Azadpur Mandi area early on Tuesday, a police official said. NEW DELHI:The police have busted an inter-state drug racket which was supplying charas (Green Ice, Hashish) and arrested two accused Moti Lal and Kuldeep Sharma, both residents of Kulu (HP) in this connection, said a police official. NEW DELHI:ShowCase Events will organise the second edition of the 'Sounds from the Desert' on April 26 at Sirifort Auditorium where Rajasthani folk songs and traditional dances will be performed.